If you’re looking for a new vacuum cleaner, the chances are that you’ve come across the Dyson brand – since it’s humble beginnings in the heartland of rural England, this brand has become a global leader in vacuum cleaning technology that continues to innovate the industry. 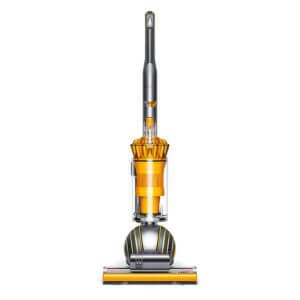 In this Home Flooring Pros vacuum review we’re going to help you buy the best Dyson Vacuum for your home flooring needs. Read on for all our Dyson vacuum reviews or use the quick links to navigate to the vacuum that best suits your needs. 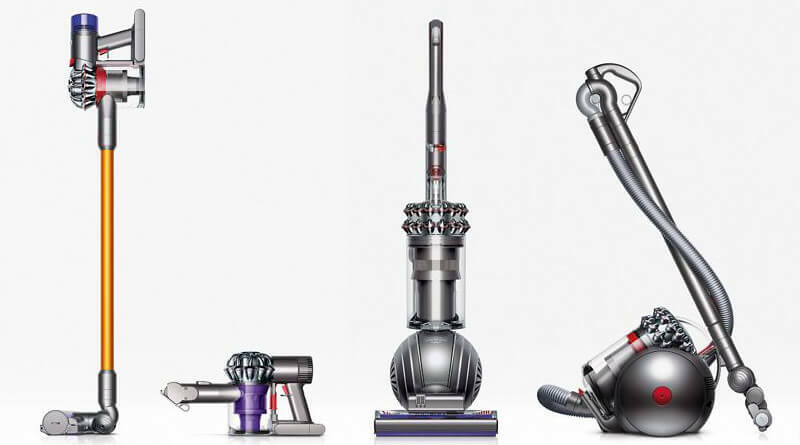 So what exactly makes a Dyson vacuum so very different from any other kind? Well, that would be the cyclonic vacuum technology that James Dyson developed back in the early 1980s. Using a cyclonic vacuum allowed for much more efficient suction and meant that vacuum bags were no longer required. Dyson was the first to introduce bagless vacuum cleaners to the market, a novelty that has now been copied by countless other vacuum brands. But whilst there are now many other bagless vacuum cleaners on the market, the Dyson models stand out for their distinct industrial design and continued commitment to innovation, recently demonstrated by the new Ball series of cleaners that pivot on a sphere for more fluid movement. Dyson also offer a full range of different vacuum cleaners including cordless, handheld, upright or canister models with some that are specifically designed for households with pets and for dust allergy sensitivity. So which Dyson is the best for your home and your particular cleaning needs? The cinetic cyclone technology means that there is no filter so you never, ever have to replace or clean a dusty, yucky filter! 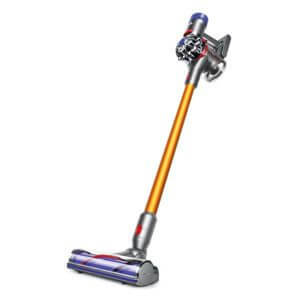 Superior suction: this vacuum comes with an extra turbine tool attachment that is excellent for removing pet hair, and will not tangle or snag on upholstery. The Ball technology has improved stability so that it will not topple over – even if you’re going at full speed whizzing around your house in emergency clean-up mode! The carbon fiber turbine head automatically adapts to every floor type – hardwood floors, tiles, carpets or rugs – without you having to flip any switches. Suction control button on the handle makes it easy to ease suction strength if needed. Ability to attach two extra tools to the wand. Decent capacity bin – 0.42 gallons to be precise, means you don’t have to empty it that often. You’re actually getting 2 items for the price of 1 as the additional tools mean you can transform it to a small handheld vacuum cleaner – great for cleaning stairs, inside your car and tricky items like computer keyboards! Integrated HEPA filtration means it captures allergens and makes the air cleaner. It’s worth noting that a cordless Dyson is not necessarily better than a more “traditional” upright or canister models, especially as it only has a bin volume of 0.14 gallons. Some users felt that this machine would not be their go-to option for vacuum cleaning the whole house, but they would use it as an addition to traditional vacuum cleaners, rather like a motorized broom. The Ball technology makes it easy to turn corners and get into difficult places. The cleaning head adjusts automatically to suit different flooring types – it can be used on carpets, wood, vinyl and tiled floors. As with all Dysons the bin is super easy to empty – just push a button and the end releases. However, many users complain that the overall design is a bit clunky and not that seamless swapping from upright use to hose use; and some people do not like having to wind the power cord by hand around the back hooks – they would rather there were a retractable cord option. 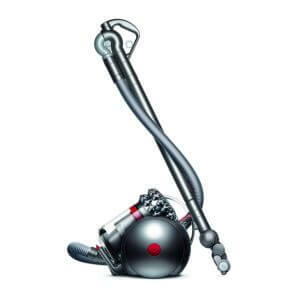 As cited above, the Dyson Cinetic Big Ball Animal Canister vacuum is our overall favorite Dyson, for its superior maneuverability and suction – numerous customer review attest to the fact that it has no problem with cleaning up any amount of pet hairs and the supplied extra turbine tool is great on upholstery. 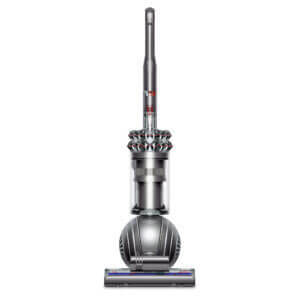 If your mind is set on an upright, then the Dyson Ball Animal 2 upright is the next best option (see image right) – it has a mega 270 air watts of suction power, which can handle even the stickiest of pet fur. This is actually a bit more than the Dyson Cinetic Big Ball Animal canister vacuum, but the upright loses points for not being as easy to maneuver. Families who suffer from allergies should serious consider the Dyson Cinetic Big Ball Animal Plus Allergy vacuum cleaner. It is the one Dyson that has been specially designed to deal with both airborne allergens and pet dander – the two most common sources of allergies. The machine’s main feature is that it has a whole-machine HEPA filtration system that ensures allergens cannot be expelled back into the home during vacuuming. And as well as the upholstery tool this vacuum cleaner also comes with some well-thought through tools to help clean tricky places where allergens can get trapped, including: a mattress tool, a dusting brush, a stair tool, and a two tools designed to reach under into crevices, or above onto the top of shelves. It is worth noting that Dyson also has cordless vacuums and canister vacuum with HEPA filtration for allergy sufferers too. 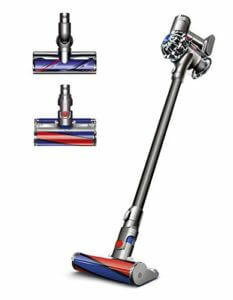 The cordless Dyson V6 Fluffy Pro vacuum cleaner has been specifically designed for hard floors made of wood or tile. It can deal with both large dirt particles and fine dust and as well as the direct-drive cleaner head for carpets, it has a soft roller cleaner head that is much kinder on wooden floors. The downside with the V6 is that it only runs for about 20 minutes before needed to be recharged, so not ideal if you have a large home with wooden floors. You can also read our post for the best vacuum for tile floors. Smart Vacuums – Great vacuum review site for UK shoppers including this Dyson V8 review. Wayfair – Shop Dyson in the US with free shipping.